264 pages; hardcover, $100; paperback, $25. On a recent trip to the Tidewater region of Virginia to visit family, my appreciation for the South was rekindled. A young, very respectful employee at a Chick-fil-A offered my children a free soft-serve while the music of evangelical Chris Tomlin played in the background. On the way home we stopped at a true Virginia institution, Williamsburg’s Pierce’s Pitt BBQ, where we sampled the always-delicious pulled pork, hush puppies, cornbread, and coleslaw. It was the Lord’s Day and the place was packed with folks proudly dressed in their Sunday best or sporting various religious paraphernalia. Both establishments exemplified the manners, gentility, and unashamed religiosity of Southern culture. Gastronomically sated, we packed the kids back in the car and headed up 95. Then, a bit north of Richmond, I spied a massive Confederate battle flag looming above the treetops over the highway. The juxtaposition of that flag with our experience was jarring. That single emblem reflects a deep contradiction in the identity and history of the South, one from which we have yet fully to shake free, 150 years after slavery’s abolition. Moreover, a less frequently discussed reality of America’s “peculiar institution” is how complicit was the North in perpetuating the horrors of slavery, with many Northerners eager to see it preserved. 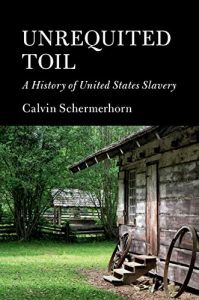 Unrequited Toil: A History of United States Slavery, by Arizona State University professor Calvin Schermerhorn, offers a fascinating account of centuries of American avarice, lust, and violence committed through chattel slavery. As evidenced by our continued national debates over race disparities in police targeting, felony conviction rates, and household incomes, among others, the ghosts of America’s past haunt us still. And slavery affected nearly every American, in the cotton shirts, ships’ sails, and banknotes made of cotton fiber. Americans tasted slavery in pies or cookies sweetened with cane sugar, chewed twists of tobacco, enjoyed a bowl of rice, or ate bread baked with Virginia wheat flour.… Those who savored Texas beef steaks or Southern barbecue ate products of slave labor too. And collateral industries thrived on it even where slavery was outlawed. Some New England factories made coarse woolens designed to clothe bondpersons. Northern bankers furnished capital to buy cotton acreage and slaves. Some banks even sold bonds derived from slave assets, becoming virtual slave dealers. Other city merchants from Boston, Philadelphia, and New York took commissions and shipped cotton. Northern financial interests in slavery were more-or-less hidden due to abolitionist focus on Southern violence, but were still deeply political. When the Republican and abolitionist senator William Seward of New York proposed limiting the interstate slave trade, the merchants of New York City protested. The surprised Seward recounted: “The root of the evil is in the great commercial cities and I frankly admit, in the City of New York.” Markets further afield were also intimately invested in slave industries—bonds directly tied to slavery were sold as far away as the United Kingdom and France. Moreover, the federal government cooperated closely with slaver interests to expand the institution’s reach. Wars against Indian tribes across the South—including the Cherokee Nation and Seminoles—resulted not only in Native Americans’ expulsion from their ancestral homes, but in opening up large tracts of land for slave labor. Not long after, pro-slavery U.S. President James K. Polk rallied Americans into fighting the Mexican-American War, which also worked in slavery’s favor when Texas was granted statehood. Schermerhorn here and previously in his The Business of Slavery and the Rise of American Capitalism, 1815–1860 also shows how federal trade and fiscal policies served slaveholding interests. Federal tariff protections buttressed Southern planters, while the U.S. Government awarded federal mail and army contracts to Southern steamship businesses involved in the interstate slave trade. The federal government also largely kept its hands out of the profitable interstate slave trade, refusing to regulate or tax it. Our conception of the “success story” of American democracy, capitalism, and Westward expansion, at least until the Civil War, is one inextricably linked to chattel slavery. Nor can the social costs of slavery be easily overstated. To be considered property is of course dehumanizing, but when one thinks of how we treat our own property, we can better understand the gravity of chattel slavery. When we no longer need something, we simply sell it. So did slave owners, with little care or attention to the damage caused by breaking up families. When someone dies, we sell that person’s property, often to strangers. We care little what they do with it. So was it done with slave owners who died, even with George Washington. Though his will directed 123 of his slaves to be manumitted, fifty-four others were sold to Louisiana enslavers. And of course consider the economic costs to generations of black Americans who endured the theft of their wages, as well as “stolen inventions, and unrepaid investments in mastering the skills that produced millions of bales of cotton and other goods and commodities.” Nor did this thievery end with slavery’s abolition in 1865. White Southerners acted quickly to restore much of the socioeconomic paradigm that had existed in the antebellum period. Formerly enslaved persons were often forced to sign labor contracts with their former masters. Black Codes passed in 1865 in some Southern states banned black land ownership in cotton districts, blocked black political participation, and criminalized black unemployment. Subsequent Jim Crow laws in turn greatly restrained their access to fundamental legal rights. Northern states in turn were uneager to accept large numbers of former slave emigres. After the Panic of 1873, Reconstruction was largely abandoned by the U.S. government—and as federal troops returned home, political violence against African-Americans skyrocketed, with lynchings reaching a peak in the 1890s. What followed was generations of systematic discrimination, oppression, and marginalization of black persons in the South—and, in truth, America writ large. Which brings me back to the paradox of the South. At a time when religious participation has progressively declined across much of America, the Christian faith remains disproportionately vibrant across the former Confederacy. Moreover, religious faith is only one of the South’s enduring laudable traits. Much of the best literature this country has produced was penned at the hands of southerners: Mark Twain, William Faulkner, Flannery O’Connor, Robert Penn Warren, Thomas Wolfe, Harper Lee, Zora Neale Hurston, Margaret Mitchell, Tennessee Williams, and Alice Walker, to name but the most prolific. The best and most definitively American music—blues, jazz, and bluegrass—are all Southern in origin, two of those created by Southern blacks. The most authentically American cuisine also derives from the former Confederacy. The South has given us both the best and the worst of our cultural identity. What are we to do with this mixed heritage? Given this legacy, it would be surprising if slavery’s effects did not linger into the present. Humans are not mayflies; we are connected to our ancestors and their tradition, and the past remains in the present. Conservatives have perhaps been too slow to recognize this. In his conclusion, Schermerhorn argues for strong connections between slavery and its legacy in the racial problems continuing to plague American society, such as voter identification laws, prison populations, and lagging wages among African-Americans. But Schermerhorn does not do justice to the historical record to leapfrog from Reconstruction and Jim Crow to the present. He mentions, for example, the Great Migration north only in passing and does not discuss at all the massive expansion of programs designed to rectify historical injustices to African-Americans. Casey Chalk is a graduate student in theology at the Notre Dame Graduate School of Theology at Christendom College. He is also an editor of the ecumenical website Called to Communion.